The Bedford hotels listed below are either in the town or we have given a rough guide as to how far they are from Bedford. We hope you enjoy your stay and find your ideal accommodation. Station: BEDFORD. 1mile. From M25: Exit at the M1 (Junction 21 of the M25) North to junction 13: follow the A421 to Bedford, then A6 and signs to town centre. Once you have crossed the River Ouse, the hotel is immediately on your right. Follow the one-way system round the square and turn left down the Embankment - hotel car park is 100 yards. Built around a 13th century tithe barn and a 17th century manor house, the hotel stands in 3.5 acres of landscaped gardens on the banks of the River Great Ouse and still retains the character of the original beamed and timbered buildings. Dine in the Anglers restaurant overlooking the river or relax over a drink on the terrace at the Riverside bar. All guest bedrooms and public areas have complimentary WiFi and guests can enjoy free use of the local leisure centre. Station: BEDFORD. 3miles. From M1 (Junction 13) follow the A421 for approximately 10 miles until A603 Sandy/Bedford exit. Proceed in the direction of Bedford. Hotel is on the right at the 2nd roundabout. Station: BEDFORD. 1mile. From North/South (M1) - exit M1 at Junction 13 onto A421 towards Bedford. Follow signs for A6 Town Centre & continue straight over at mini roundabout, passing the hospital on your left. Go straight on at large roundabout & turn left at next roundabout into Cardington Road. Take 2nd turning on right into Duckmill Lane & hotel car park is on your right. Holiday Inn Express Bedford is a contemporary and stylish hotel offering refreshing simplicity. The hotel is in an excellent location for exploring the local attractions including Woburn Abbey, Knebworth House and the Bedford Museum. The hotel boasts 80 well furnished and well equipped bedrooms along with a hotel bar and restaurant. Station: BEDFORD. 1mile. North/South - from A6 hotel is located at the Elstow Interchange to the south of Bedford, A6/A421 road junction. East - from A1 take the exit towards Bedford on the A421 for 9 miles, take exit towards A6 Bedford/Luton, the hotel is located at the A6/A421 road junction. West - from M1 exit at Junction 13 onto the A421 towards Bedford for 8 miles, take exit towards A6 Bedford/Luton, the hotel is at the A6/A421 road junction. Station: BEDFORD. 6miles. From M1: exit junction 19 onto A14 toward M6/Felixstowe/Kettering/Corby. At junction 10, take the A6 exit. At the roundabout, take the 3rd exit onto A6/Burton Latimer Bypass. Continue to follow A6. Go through 8 roundabouts. Destination will be on the right. Located within peaceful Priory Country Park, this comfortable and convenient hotel is a 5-minute drive from Bedford town centre. Within the country park is a cinema, gym and bingo - all only 5 minutes away. A family-run hotel and pub, the Grafton offers budget rooms and bar food. Bedford Railway Station and town centre are less than 5 minutes' walk away. Free Wi-Fi is available. 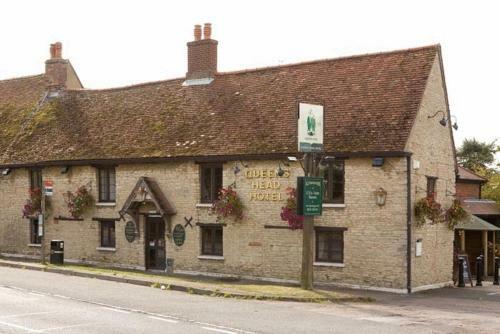 Located on the A6, this hotel is 5 miles from Bedford. It has a restaurant and welcoming bar with excellent food and a good range of Real Ales. The Queens Head Hotel was once frequented by musician Glen Miller During World War II. The Park Inn by Radisson Bedford is a wonderfully vibrant hotel, set in the busy market town of Bedford. Relax in the RBG Bar before dining in the RBG Grill or work out at our Innaction health and fitness centre. Located just south of Bedford, this Holiday Inn Express is a short drive from the A1 and M1. It offers comfortable and affordable accommodation and free parking. A family-owned inn with a personal touch, De Pary's welcomes business and leisure guests with a beautiful garden, all within easy reach of the M1/A1 motorways. Hidden away in De Pary's is a truly lovely garden. The Barns Hotel is situated in a beautiful riverside location, within 3.5 acres of landscaped gardens, yet just 10 miles (16 km) from the M1 and 8 miles (13 km) from A1. In Bedford town centre, the 18th-century Swan features good food, a Roman-style pool and a jacuzzi. The stylish rooms have air conditioning, flat-screen 32-inch TVs and movies. Nestled amid the tranquillity of acres of rolling gardens and parkland, this classical Georgian house aims to continue its ancestral traditions of hospitality throughout its 18 individually furnished bedrooms. Woodlands Manor is a secluded Grade II listed manor house in acres of grounds and gardens 2 miles from Bedford town centre and accessible from the M1 motorway. A 10-minute walk from Bedford town centre, Shakespeare Hotel offers rooms with free Wi-Fi, a bar and a restaurant. There is free private parking. The Embankment Hotel is in a beautiful location beside the River Ouse. Only a few minutes' walk from the town centre, this riverside setting overlooks quiet gardens and a Victorian bridge. For hotels accommodation in other areas nearby see Wellingborough hotels & Luton hotels.